This entry was posted on Tuesday, May 15th, 2012 by Frances Ryan. Oh dear, it’s been more than a week since I last posted. Sorry about that. It’s not that I’ve been sitting at home sulking though. No, I’ve been sitting at home writing essays like a mad woman! So, let me get you up to speed! School: The past week, as I mentioned, was spent working on final essays for this past semester. The last of them was finished yesterday and turned in—with a bit of time to spare. I’m not feeling too confident about a couple of them, but I’m sure I did OK. I am pleased to brag, however, that I have received a few marks over the past week—all distinctions! Yeah, that’s nice for the ego. So, the semester is done and that means no more classes. But I do have that dissertation to work on, so this probably won’t be my last school update. Edinburgh (Or: The Mini Eberle Reunion): After turning in my essays yesterday, I hopped on a train to Edinburgh to meet up with my cousin Rita and her friend, who are in Scotland as part of an organised tour. They had the afternoon free to tour on their own, so I was invited through as a personal tour guide. And since they’d already done the castle thing with the group, I got to show them a few other highlights. We met along Princes Street then grabbed a coffee (well, I had mint tea) to catch up and chat about what we wanted to do, then we went to see the city. Our first stop—The Scott Monument—was easy enough, especially since we opted to not walk to the top. Then we wandered back toward the Floral Clock. Which we kind of saw in that the workings were sticking out of the ground, but it was in the process of being planted so if you didn’t know it was meant to be a clock you’d have missed it. From there, we wandered through the New Town on our way back to Princes Street Gardens where we sat to visit whilst Rita enjoyed (or at least took a sip of) Scotland’s number-one selling beverage, Irn Bru. I pointed out buildings and landmarks, explained how The Mound was formed and the Nor Loch drained, and even got to bore my captives with the story of how Paul and I met—and (when we’d made our way to The Royal Mile) I got to point out where we met, too! 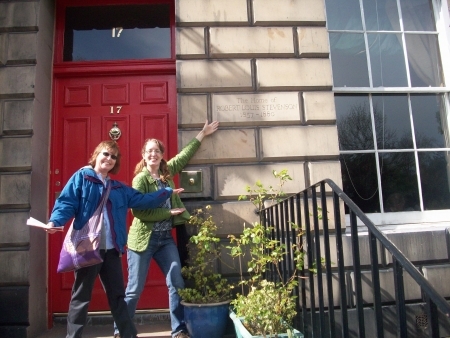 Up on The Royal Mile, we attempted to visit The Writers’ Museum (we were 15 minutes too late!) before going in to see St Giles’ Cathedral. Then, it was back to the train station for me. Of course, since one of the things Rita had on her list was closed (The Poetry Library) I’ve promised to go back and see it (and report back) for her. I’ll even have to stop by the Floral Clock on her behalf. It was an absolutely fantastic afternoon and I am so pleased that I was invited to be part of Rita’s holidays. We’ve decided we’re going to have to do it again—maybe Rome next time with a private audience with the Pope. I’m so glad that you had such a good time with Rita and her friend. I still need to do my own visit to the Scott Monument and I hope I can overcome my fear of heights to take on those stairs. The view from up there must be wonderful. I’d like to stand on/in Nor Loch, too. Just to be able to say I was there.